Have you ever wondered why the British government and parliament have so much concern for Africa and Africans that they would launch commissions of inquiry into the continent’s troubles? A range of presentations from across Europe, Asia, Oceania, and Latin and North America will address the War’s consequences and legacy in the memories of participants and for successive generations. These presentations are organized into two major themes which reflect the ways in which the War continues in many countries to play a part in historical consciousness and everyday life. ‘Remembering, forgetting and silences’ explores individual memories in relation to dominant discourses, identity, myth and intergenerational transmission. The second of the two themes, ‘Using memories of war’, includes reminiscence as a therapeutic intervention and the ways in which the media has shaped recollections of the War. That is right. Africa and Africans were somehow not a part of that war’s consequences and legacies. Yet the King’s African Rifles suffered many thousands of dead and maimed in the Burma, Abyssinia and Somalia campaigns. Then there were the taxes and other privations that Africans had to suffer as their colonial rulers fought a total war. This is not a rant to demand ‘inclusion’, a term that I detest with every cell in my body, it is to note that even as the British establishment crows about helping Africa, they nevertheless maintain boundaries between the native and the master in their national myths. There is plenty of print and conferencing available when you die of hunger, HIV or just plain old atrocity, but not when you take a bullet for King Georgie. The thanks must flow in one direction only: Africans must kneel before the British in gratitude at Blair’s Commission and Bob Geldof’s pronouncements. But they, oh no, they will not acknowledge that at the hour of their greatest weakness, some darkies stepped in and did a job. Pity is the worst thing in the world. When you are pitied and helped out of pity, your life is often taken off your hands. Pity degrades and kills everything it touches. And that is what we have become, a pitied people who come on hands and knees begging for more pity, nay actually, it is worse than that, we now demand pity as a human right! Having said all that, I am embarrassed at how poor my education in history was in Kenya. 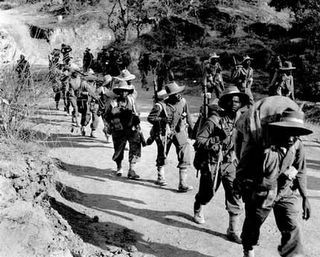 I did not for example know that almost every Kamba male who was not handicapped was recruited into WW1 service; or that so many died and suffered (45,000 officially and 200,000 unofficially); or that many campaigns were won through the tenacity and courage of African soldiers. They may have been fighting in an absurd war given that they were the colonised fighting to keep others from being colonised, but courage should be acknowledged and applauded wherever it rears its head. The recruitment of the King’s African rifles who numbered over 120,000 in WW2 brought many people from incredibly diverse backgrounds together. They took to speaking English, Lingala, and Swahili as common languages, creating the templates for the nationalist politics that followed and led to the formation of the continent’s governments. The salaries they were paid sparked an economic boom after the war and tied a large proportion of the people to the cash economy. The war also radically changed the colonial notions of the African person. After the high fatality rate of WW1, recruiters had a tough time trying to attract Africans to join up. Few now know that the colour bar was dropped in 1939 to enable readier military recruitment. Growing up, I was always taken with the bronze three-man statue on Nairobi's Kenyatta Avenue - can you picture it? The guy with a stick is a carrier, in the middle is a KAR rifleman flanked by an Arab rifleman. They appeared so strong and firm, which I suppose is the whole point of the thing. And the stories from the wars are gripping. Kenyan and Tanzanian beef for example fed the million men on the allied side stationed in the Middle East. Then here comes the King’s Africans Rifles, who when they were not putting down rebellious types on home soil, found time to ship to Burma and face down Japan’s crack troops - called the white tigers - in the ‘valley of death’. Then there are characters like Color-Sergeant Kumani of the 1st Battalion, King’s African Rifles who on October 7, 1914 won the Distinguished Conduct Medal in a battle at Gazi for his bravery ‘in leading his company in a charge after all his officers had been shot down, and drawing off the enemy’. Why did he do it? Why did he run into enemy fire when his white officers fell? My late grandfather was a medical officer during World War 2 and I remember him being called daktari by everyone in Wida, Kiambu. I wonder what he experienced in Burma. What he felt travelling so far, treating gaping wounds and doses of the clap, losing friends to an early death for a cause that was not theirs. He was such a bunch of contradictions: charismatic, kind to me, brutal to those he did not like, clever, seductive, funny… He was a full person, but I regret that I was too young to talk to him about the things that I have since learned about his time ‘over there’. Beyond these personal asides, I am as always struck by the power of learning history. And have developed a conviction that to be ignorant about history is to be an intellectual cripple: driven only by the demands of the present and yet unable to understand from whence they come, and therefore ultimately meeting the future unarmed and more naked than need be. Maybe I am wrong and my high school history education was superior. But I was too sleepy to care during those hellish afternoon double lessons with this teacher we called Rook. He would stand in front of the class like a peacock, chin up, hands on hips, and would authoritatively repeat the textbook on your desk to a letter. The moment I set eyes on him, a wave of sleep would overcome me. I always thought he should have come with one of those ‘do not operate machinery after ingestion’ warning signs. Yes, perhaps it was all Rooks’ fault.